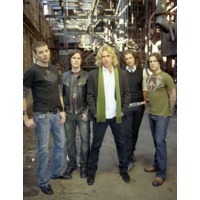 Collective Soul is an American rock band originally formed in Stockbridge, Georgia. Collective Soul broke into mainstream popularity with its first hit single, "Shine", which came from their debut album Hints, Allegations, and Things Left Unsaid, released in 1993. They have recorded seven Number One mainstream rock hits. Collective Soul was inducted into the Georgia Music Hall of Fame on September 19, 2009.